The quilt block called Kitty Corner is one of hundreds of nine patch blocks and this particular one would be a wonderful choice to get your quilting journey started, if you are a beginner quilter. 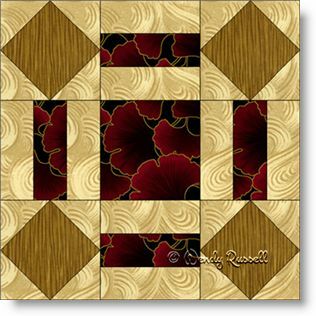 This quilt block introduces you to a common patch called square in a square for each of the four corners. In the sample quilts illustrated, I made two different versions on the quilt block -- by reversing two of the fabrics and then laying them in the quilt as alternate blocks. This achieves a secondary pattern and so your resultant quilt can look far more difficult to onlookers than it really is. A win-win situation!